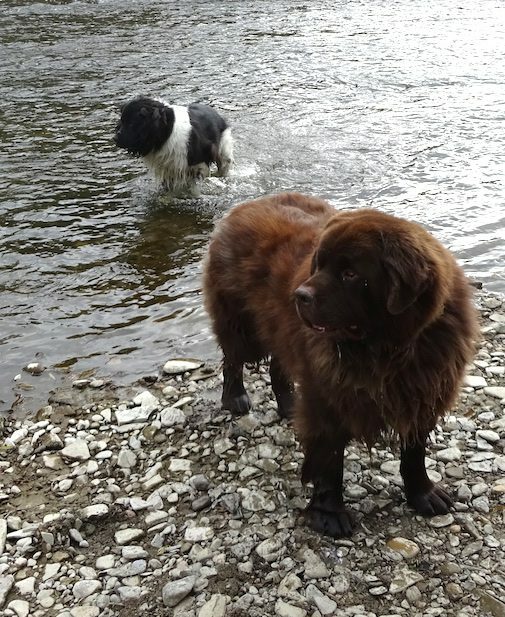 For those who don’t know what this is about, our Newf Ruby had surgery to correct a torn cruciate ligament on her hind left leg about 3 weeks ago. She’s continuing to get stronger and we’re gradually lengthening her walks. The ligament on her hind right is also torn and that knee will need to be fixed up as well. That will happen when she starts putting all her rear weight on her left (repaired) leg, and very little on the right. The idea is that her left leg will be reliable after the surgery on the right one. Today we walked to the end of our street, and west to the next one and then back – with plenty of rests along the way.